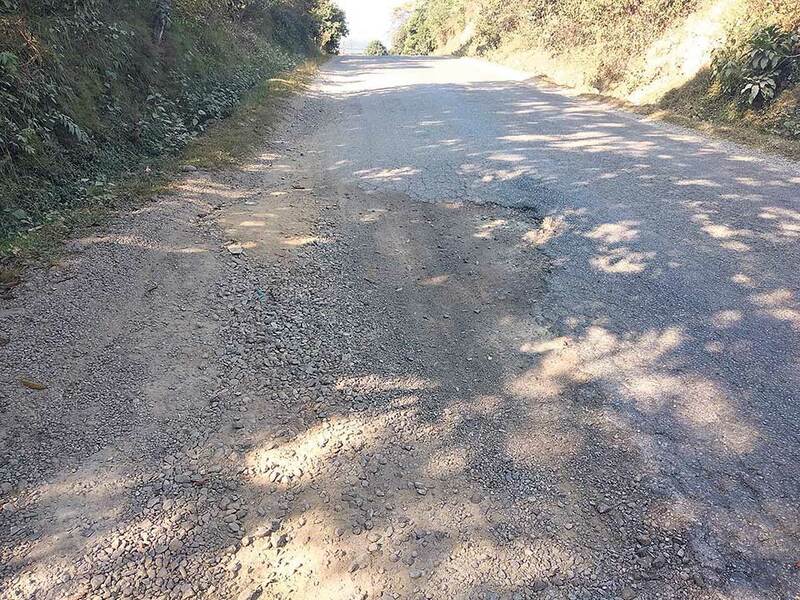 GORKHA, Nov 1: The blacktopping of Abukhaireni-Gorkha road was intensified just a few weeks before the end of the last fiscal year just to ensure that the budget allocated by the government would not freeze. However, the work done in hurry has resulted in immediate cracks and bumps. Four months since the blacktopping, the road has developed potholes in various sections making traveling riskier. The heavy traffic along the road has further deteriorated its condition. The Division Road Office (DRO), Damauli, had awarded the contract of blacktopping the road to a private company after the sides of the road started eroding. Despite the poor quality of work, the DRO paid the contractors. The contractor was criticized then for using sub-standard materials, continuing work during incessant rainfall and not blacktopping as per the standards. All those accusations have now been validated. A total budget of Rs 73.5 million was invested for blacktopping around 23-kilometer of the road from Abukhaireni to Gorkha. The locals have been greatly disappointed by Ashish Fewa JV, which was awarded the contract of blacktopping the road. There are several bumps in Abuwa, Daskilo, Birenchowk, Laxmibazaar among other areas. Gautam Shrestha, an engineer at the DRO, defended the contractor saying, "The road has been affected as the sewage is not well managed and landslide debris have fallen along the road." The contractor had assured to repair the road before Dashain but has not done anything yet. Subarna Shrestha of Ashish Fewa JV claimed that no sub-standard materials were used during the maintenance work. Apparently, the contractor had expedited the work in rush without proper study and research. Rajanraj Pant, mayor of Gorkha, stated that the municipality had immediately informed the DRO about the potholes and bumps.